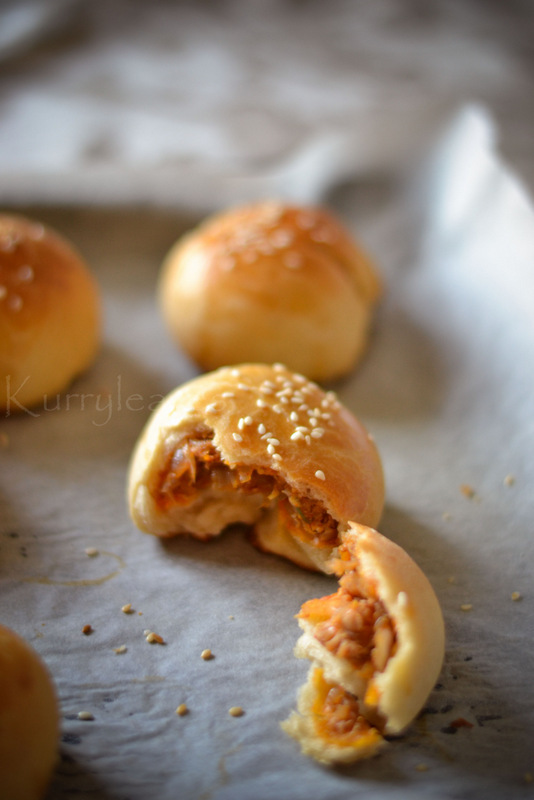 Soft and fluffy stuffed buns,with spicy chicken filling. Prep Time: 120 minutes . To prepare the dough-In a mixing bowl combine together dry yeast,warm water and 1/2 tbsp sugar.Mix well and leave aside for 10 minutes. Lightly beat the egg ,set aside.Boil the milk and allow to cool until warm to touch.In a large mixing bowl add the warm milk,remaining sugar,oil and salt to taste.Mix well till the sugar dissolves. Now add 1 cup all purpose flour and mix well to form a smooth paste. Add the beaten egg ,yeast mixture and mix well.Add the remaining flour, 1/2 cup at a time and knead to form a smooth dough. 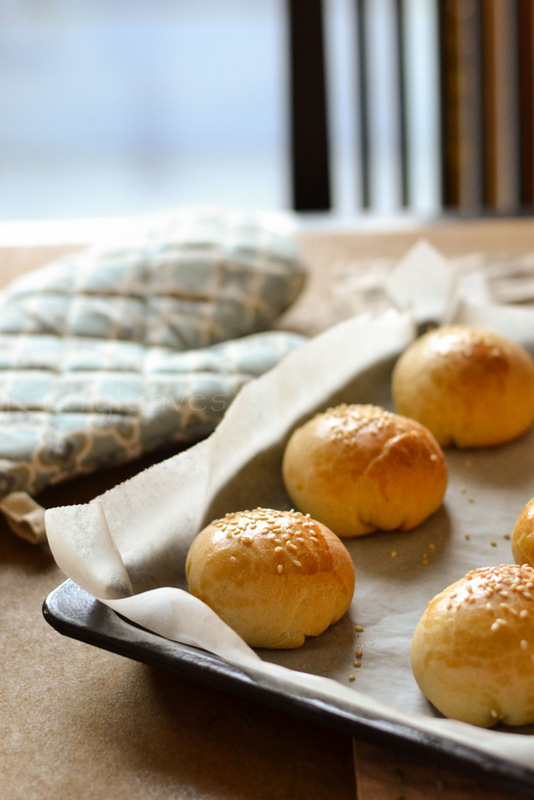 Knead the dough for 10 to 12 minutes.Cover the dough ,and set aside in a warm spot till it doubles in volume (for about 1 to 2 hours,depending upon the room temperature). To prepare the filling.Heat oil in a pan ,add ginger , garlic and green chilies.Saute for few seconds , add chopped onion and salt.Saute until onion turns golden brown. Reduce the flame to low and add kashmiri chili powder,and coriander powder.Saute until masala starts to leave the sides of the pan.Add the cooked chicken and add more salt ,if required.Mix well and cook for about 2 minutes. 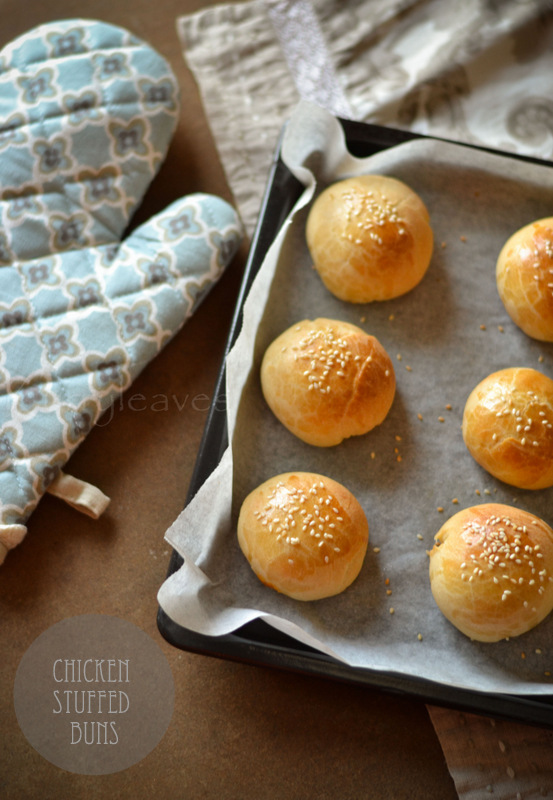 Switch off the stove and allow the mixture to cool completely.To prepare the stuffed bun,punch down the proved dough and divide it into 12 equal parts.Take one portion and roll it into a small disc. Place 1 to 1.5 tbsp of the prepared chicken mixture over this.Cover the filling with the dough by gently pulling the edges towards the center and then shape it to form a ball.Repeat with the remaining dough. 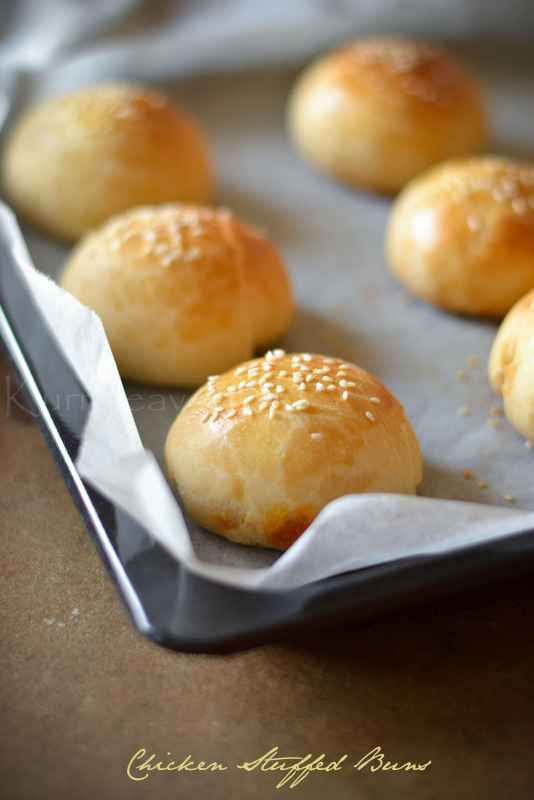 Place them onto a baking tray lined with parchment paper.Apply the egg wash and sprinkle sesame seeds on top.Cover loosely with a cling film and set aside in a warm spot to prove for about 20 minutes.Bake them in a preheated oven @ 180 Deg C for about 15 to 20 minutes. You could also add 1/2 tsp garam masala to the chicken masala,just after adding the chicken, for an added flavor. Start with 2 cups flour(total flour),add more only if required.If you add too much flour ,the dough will be dry and the bun will turn out hard and dry.Initially the dough will be a bit sticky and as you knead the dough it will be easy to handle and less sticky.I used about 2 and 1/4 cup all purpose flour.